For best results, do not till or disturb the soil. Thin turf cover: Broadcast the wildflower seed over the area then rake or drag the area to obtain seed-to-soil contact. Average turf cover: Scalp the turf to 1 inch, remove the clippings, then broadcast the seed over the area and replace the clippings evenly as a mulch. A mechanized seed drill can be used without removing the clippings. Heavy turf cover: Herbicide and let the area sit for 1 month. Scalp to 1 inch, then follow step number 2. The establishment of wildflowers is not recommended for areas of heavy turf and areas of excessive weed infestation. The use of a mechanized seed drill designed for planting wildflowers produces the best results. 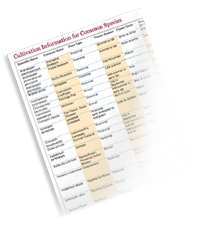 Click here for cultivation information on some favorite species. Under natural conditions, wildflower seed ripens and is dispersed by wind and animals in late summer, fall, and winter. Following the natural cycles for the wildflower seed will produce the best germination the next season. If the seed is planted at other times of the year, the percentage of germination will be lowered and the overall effect of the bloom period will be greatly reduced. For more detailed information on bloom times throughout Florida, please click here to download Seeding dates for Florida ecotypes of native wildflowers and grasses. This factsheet provides estimated dates for the ideal combinations of soil temperatures and rain that are most likely to promote relatively quick germination, emergence, and seedling growth. This document was produced by Jeffrey Norcini, OecoHort, LLC with support from the Florida Wildflower Foundation. 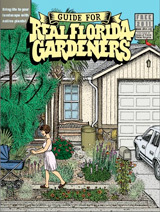 Landscaping information for "Real Florida Gardeners"
The The annual Guide For Real Florida Gardeners from the Association of Florida Native Nurseries features informative articles on native plant landscaping and lists sources for native plants, landscape and other services. The 2011 edition is available for viewing on-line. For more information, visit AFNN.